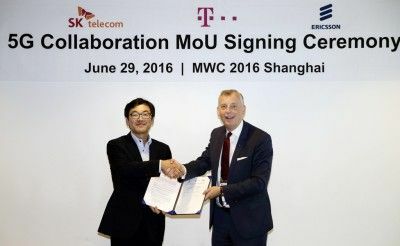 SK Telecom (NYSE: SKM) announced today that it signed a memorandum of understanding (MOU) with Deutsche Telekom and Ericsson to cooperate in the development of the 5G core network*. The signing ceremony took place at Kerry Hotel Pudong, where the GSMA Mobile World Congress Shanghai is being held. Through the partnership, the three parties will deploy trial network in Korea and Germany based on key 5G technologies, including NFV(Network Functions Virtualization), SDTI(Software-Defined Telecommunications Infrastructure), distributed cloud, and network slicing technologies. The aim of this world's first transcontinental trial is to provide optimized end-user experiences by providing consistent quality of services and roaming experiences for advanced 5G use cases with enhanced global reach. 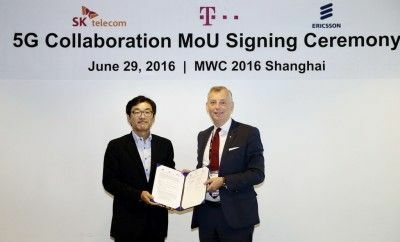 As SK Telecom in Korea and Deutsche Telekom in Germany collaborate with ecosystem, the alliance will jointly develop 5G use cases, conduct global marketing promotions, and work for potential standardization. Moreover, at the GSMA booth located within the GSMA Innovation City, SK Telecom and Ericsson has demonstrated 26.9Gbps transmission speed over the air, which the fastest 5G transmission speed demonstrated so far. The two companies have successfully demonstrated the 26.9Gbps in May 2016 in Korea. Moreover, they are also displaying 'Software-Defined Telecommunications Infrastructure (SDTI)*, an infrastructure platform that will be applied to the 5G pilot system by the end of 2016. Meanwhile, Alex Jinsung Choi, CTO of SK Telecom, has participated in the panel discussion ("5G – Beyond speed into a new paradigm") of the GSMA Network 2020 Summit. CTO Choi shared SK Telecom's 5G vision, stressing that the 5G system will make people's lives safer, more efficient and more pleasant/interesting by offering personalized and customized services based on open platforms unlike the former generations of the mobile networks.